Love this shampoo, it's very purple when it comes out of the bottle and goes a lovely violet colour whilst lathering it up on your hair. Wait a few minutes, wash it off, repeat and it leaves hair with a lovely greyish violety tone. (I did have a grey toner added at the salon prior to buying this stuff but still think if you are blonde you would go someway to being this colour). Only downside is...it turns your nails lilac so I would definately recommend wearing gloves then there would be no downside at all. Happy shampooing!! I have silvery/blond hair and thought this product would be perfect to use on my hair. I have only used the product once as the product has ruined my extensions and dyed them purple. The shampoo took out a couple of the brassy tones in my hair but would not advise to use on extensions. This is the best hair product I have ever found. Gives soft white/silver hair. Love this shampoo as recommended by my hairdresser. Really works even with one application and leaves hair in excellent condition, does not dry hair out and takes away any brassiness. This is literally the best shampoo in the world, I have always bleached my hair and have always struggled with it being yellow. I have tried toners but they just fade back to yellow over time. I use this as my every day shampoo and after I dye my roots i will put it on and leave it on for 10 minutes to take all the yellow tones out of it. My hair has never looked this good. So, I'm pretty 'hippy' when it comes to all the products I use. Even on my hair. However, since going blonde I had to give up the whole co-wash routine because I needed to tone out the brassiness. I tried using Kevin Murphy's Blonde.Angel Treatment only and it was ok for taking out the brassy yellows and amazing for conditioning the hair, I even tried Davines Alchemist Silver Conditioner - which was a bit meh for me. 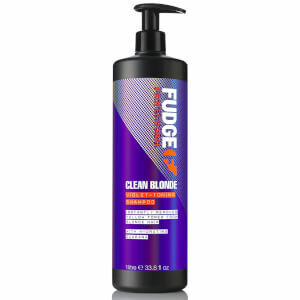 BUT using this is combination with Fudge Clean Blonde Violet Conditioner WOW. I've got to say, yeah it completely cleans up the brassy issues. I have waist long blonde hair and lots of it so I require several pumps. Just focusting it at the roots and dragging the suds down is not enough to cut out the yellow so I need to add fresh pumps to the length. So the 1000ml is very economical for me. The price can't be beat. The pump is really sturdy. I wish the design of the label and bottle were nicer and more minimalistic and modern but whatever. I can overlook that. Years of Kerastase, Aveda, and much pricier products and this killed all of them. IN LOVE. Just as described. This will last me ages but I'm already going to reorder another as it's such good value. love this product! quite amazed by the results! did searched for some reviews before purchasing this item. would like to re-purchase in the futurez!